Interview with Dinesh Gupta author of "Kaise Chand Lafzon Men Saara Pyar Likhun." This week I had the opportunity to interact with poet Dinesh Gupta, a software engineer who is passionate about poetry. Here he tells us about himself, his books, his idol and what it is that keeps him writing. I am Software Engineer by profession and a poet by passion. I am basically from Mandsaur, a district of Madhya Pradesh. I currently stay in Pune and am working as a manager in a Software Firm. What are your other 2 books about? My First book “Meri Aankhon Men Muhabbat Ke Manzar Hain” is a collection of Poems based on a variety of topics like Muhabbat, Deshprem, Dreams, Social imbalance, Corruption, Terrorism, Life etc. I believe in 2 aspects of love - one for your country and one for the one you love. My Second Book “Jo Kuch Bhi Tha Darmiyaan” is a collection of articles that connect with Poetry. Similar to the first one, this is also based on random thoughts. I would say it’s a collection of Articlic-Poetry. How is this book different from the other two? My earlier books were collection of Poems on any random topics that happened in life or things that came into my mind. In this Book I have tried to arrange the poems in a professional way. This book is a collection of poems based on only romance which is better suited to the market today. How did you come up with this beautiful title – “Kaise Chand Lafzon Men Saara Pyar Likhun”? Software Engineer and poet…When do you get time to write? What or who inspired you to write this book? I was inspired to publish my work after seeing the tremendous response I got from the readers on my Facebook posts and blog. My poems also got appreciated from many editors who belong to reputed magazines. All these things inspire me to write! How long did it take you to finish it? I think it took 1 year to finally have the book in my hand. Who is your favorite poet and what is it that really strikes you about his/her work? My Favorite poet is Dr. Kumar Vishwas who actually inspired me to write. I am inspired by the tales of his struggles, the tough decision he had to take and the mind-blowing poetry he writes using simple and touching words. What is the best compliment you have received about your work? Well, Almost everyone who got to know about my poems said its mind blowing, amazing, fantastic, touchy, tremendous and “you write so well” etc. I am glad to receive all these comments, but the biggest one I got was when few readers said “You are not less than Dr. Kumar Vishwas and you can be on same stage if your approach is good.” There is not better feeling than someone comparing you to your idol. Right now I am focusing on marketing of this book. Also these days I am actively performing in poetry events. I have not finalized anything for my next book yet. How has your experience with the publisher been? It was a nice experience. Aniket is very cooperative and transparent. Although he is new in this field and we are facing lots of issues related to the retail distribution of the books, but I found it was a nice decision to choose a new publisher rather than an established one since I was able to take charge of the marketing in my hand. There are lots of other issues with established publishers mostly transparency. Overall I think it was a good deal. I love what I do because I get to connect with very interesting people and read great books. Shama contacted me to review her book some time ago and I jumped at the opportunity because I loved the fact that it was a self-help book and also that she wrote such lovely e-mails to me :). It’s great to know Shama and I live in the same city and we hope to meet up soon….will post the pictures of our meeting on Facebook when we do. Till then, Happy Reading. Stay Blessed! It is not a condition or situation that is presented to some and kept away from others. It is in our own hands to overcome guilt, self-pity, regret and anxiety to lead a fulfilling, happy life. Shama Patel, a Professional Psychologist, enlists the ways and tricks to stay happy forever. 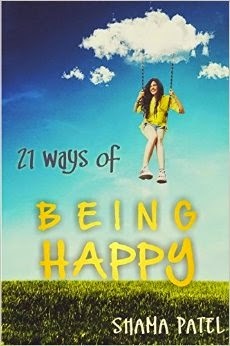 21 ways of Being Happy is written with the aim of bringing you closer to yourself. It is a book that will help you charter the course of your life, your own way. I liked the cover, which is courtesy Chandni Dua. It exudes so much positive energy that you can’t help but smile even before you begin to turn the pages of this very interesting book. The book is well-written. The language is lucid and the quotes by famous people at the beginning of every chapter helps hold your attention and prepares you for the words of wisdom contained in every sentence in the book. 21 ways of Being Happy is a self-help book everyone should read! I mean it when I say “everyone” because this book has so much to offer in terms of getting to know oneself better! In a world where all of us are so busy trying to make ends meet or striving towards goals that we have set for ourselves, it is important to sit and ponder over the things the author mentions in her book. Shama is not preachy when she tells us about the 21 ways in which we can attain happiness. Instead her experience as a psychologist is clearly evident in the examples she cites from her life as well as others to tell us that happiness is attainable and it is lurking around the corner and that all we have to do is reach out and catch it! With so much positive energy flowing from the book, I am sure that each reader will feel blessed as they turn the pages of this nicely-written book. 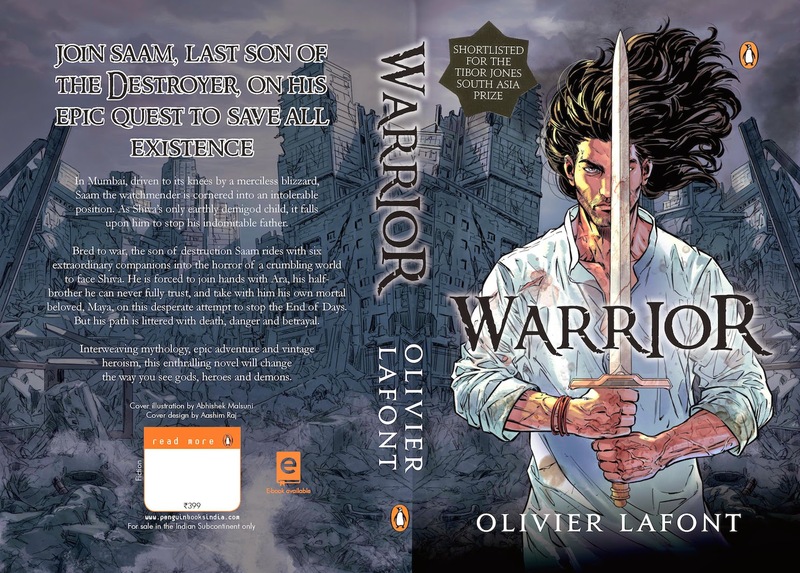 Interview with Olivier Lafont author of "Warrior." An actor, a model and a writer, Olivier Lafont is a very talented individual! Recently I got the opportunity to ask him a few questions about his book, his childhood as well as his creative pursuits. Read on to know what he has to say…. ➢ Tell us a little about your childhood? My family moved from France to India when I was about 7. We lived in Delhi and I went to the American Embassy School, and I grew up with French, Indian and American culture. I didn't speak any English or Hindi when we moved, so the culture shock was significant. It was as I learned English that my initial love for language, reading and writing began to develop. I started writing stories seriously from a young age. Over time I developed other interests, like acting and basketball. ➢ What are the books that have influenced you the most? From the earliest, Redwall by Brian Jacques, The Chronicles of Prydain by Lloyd Alexander, The Shannara series by Terry Brooks, Memory, Sorrow, and Thorn by Tad Williams, The Wheel of Time by Robert Jordan, The Eearthsea Quartet by Ursula K. Leguin, A Song of Ice and Fire by George RR Martin. ➢ Name a writer you would consider a mentor? I don’t think I consider any writer a mentor. ➢ Which book are you reading now? I just read Mark Lawrence’s The Broken Empire series and Joe Abercrombie’s The First Law series. ➢ How do you find time to write? Since my careers are fairly modular I’m able to fix and shift chunks of time here and there. I may shoot for a month and then take a few weeks to write. It’s flexible, but I do make it a point to make the time when I’m in a writing space. My wife. She’s the most intelligent, most extraordinary person I've ever met. I admire her perspective on life, her uncompromising honesty, how she thinks about and through things. An exceptional person. ➢ Actor, Model and Author…How has the journey been? It’s been fantastic. I've had the fortune of being part of some great films, many great ads and now I have a book published by Penguin. Living in Mumbai has been a wonderful experience and working here has also been fun. And I met my wife here! Life just keeps getting better and better. ➢ Why did you choose to write about this particular genre? I've read and written in the fantasy genre since I was very young. It was something that I've always loved, long before Harry Potter popularized the genre for the world. Writing ‘Warrior’ in this genre was a very natural progression. ➢ Describe your writing process – Do you write more by intuition or logic or would you define it as a combination of both? A combination of both. Since storytelling is primarily an emotional activity, I use my intuition a lot to gauge the effect my writing should have on a reader. I believe that great storytelling also requires great structure, and structure needs a logical approach. So it all happens at the same time, logic and intuition work together to craft a great story. ➢ How much time did you spend writing your novel- Warrior? At the time I was working full-time and working on ‘Warrior’ on weekends, so my sense of how long it took is somewhat distorted. All together I suppose about three months. ➢ What was the hardest part of writing this novel? I didn't really face any difficulty with writing the novel. For me writing is and should be an effortless endeavor. Art needs to be flowing and easy, not hard. ➢ Which part of the writing process did you enjoy the most? Everything - from the very beginning, the creation of Saam and the story and his dynamic relationship with his father Shiva, to the actual writing, creating the other characters and subplots, to the editing. Every part of it was fun. ➢ Your book has been shortlisted for the Tibor Jones South Asian Awards…How does it feel? It’s nice to have your work recognized by a literary body of standing. It’s a really lovely validation of your creativity and work. ➢ What projects are you working on next? I've just written a feature film script, the first one I've written for myself as the main character. It’s a fun comedy, and I’m looking for a producer to partner with on it. What’s particularly interesting is that it could be an Indian film or an international film, so the producer could be Indian or international. ➢ Words of Wisdom! Is there anything you would like to tell your readers? Read what you enjoy and read with joy!